Shooting outside, daylight, without character.nA shell is the external skeleton of a mollusk. 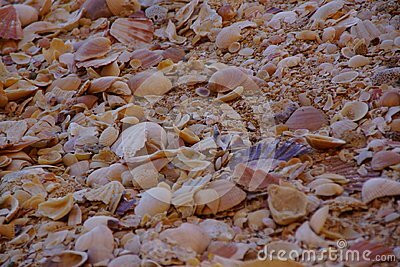 The majority of mollusks with shell are in the class of gastropods as snails, and in that of bivalves as oysters. Three other classes of mollusks secrete systematically a shell: scaphopodes dental consonants, polyplacophores chitons and monoplacophores. It is also the case for almost all of cephalopods, even if she is sometimes reduced and covered by the coat `bone` of the cuttlefishes or `feather` of squids. She It is absent at the adult`s only in a rather small number of cases: certain slugs, most of the opisthobranches, certain pieuvres, as well as two groups of atypical mollusks, solÃ©nogastres and caudofovÃ©ates, formerly grouped included for that reason in the class of aplacophores. One subdivision of the malacology, the study of mollusks, conchyliology, is dedicated to the study of mollusks with shell.